I am all about easy dinners!!! That’s how I created this Oven Baked Pork Frid Rice recipe. I didn’t want a recipe where I had to stand in front of the stove top mixing and stirring for 30 minutes. 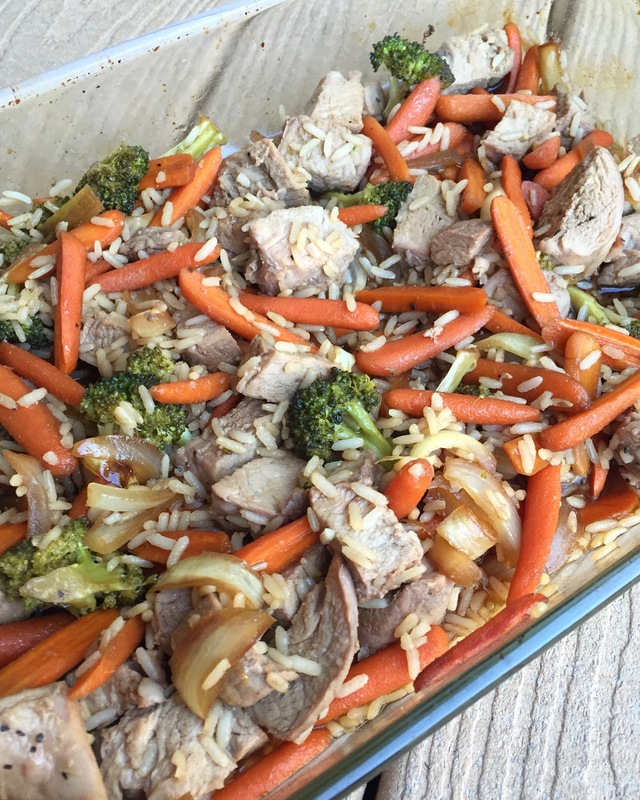 With this easy dish all you have to do is chop the veggies, toss everything in a pan, cook it, and mix in rice. It tastes amazing, and it’s so, so easy to make! The way I made the recipe makes it free of dairy, egg, gluten, wheat, and nuts. You can easily swap out the soy sauce for coconut aminos and it would make the recipe also free of soy and all of the top eight allergens. 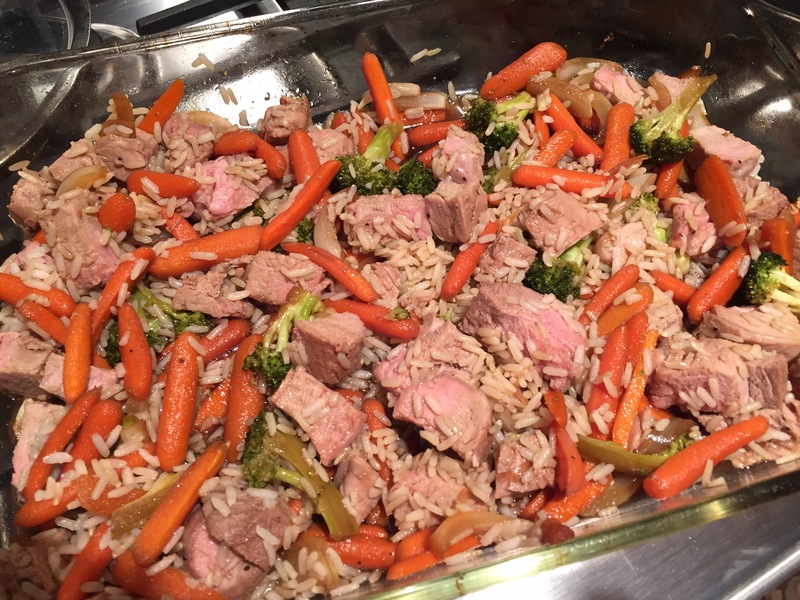 To make Oven Baked Pork Fried Rice I used a 9 x 12 pan, a bag of baby carrots, one head of cut broccoli, one onion and one pork tenderloin. I tossed them all with olive oil salt and pepper before adding the sauce to cook it in and also covered the pan tightly with foil for the first 15 minutes of cooking. Pop it in the oven at 350° until a meat thermometer registered at 150°. Take it out of the oven slice up the pork tenderloin, mix in the rice and pop it back into the oven for an additional 15 minutes, making sure to stir once while cooking. The only thing left to do now is eat! Preheat oven to 350°. Add oil and vegetables to a 9 x 12 pan and stir to cover the vegetables with oil. 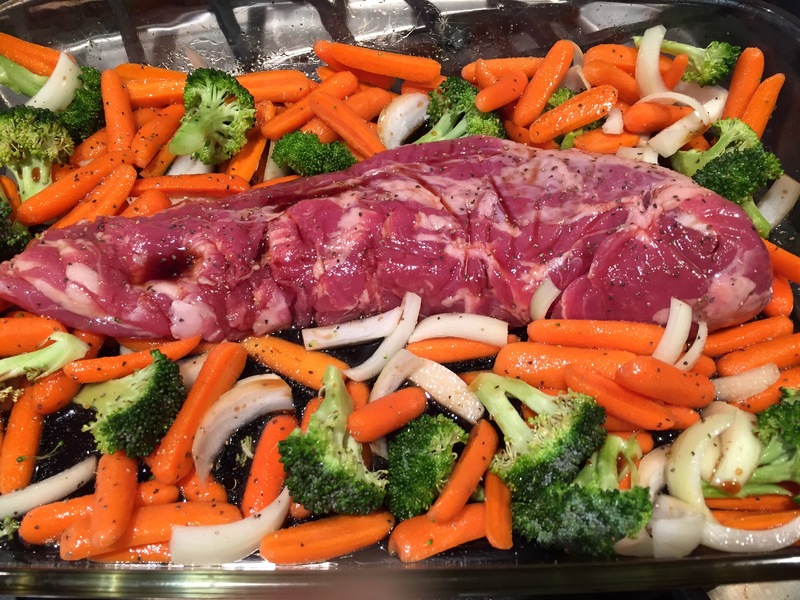 Arrange the vegetables to the outside of the pan and add the pork tenderloin to the center. Salt and pepper the vegetables and tenderloin to taste. Add maple syrup, soy sauce and cider vinegar to a small bowl and mix well. Pour the sauce over the vegetables and pork tenderloin. Tightly cover the pan with foil and bake for 15 minutes. Remove foil and insert meat thermometer into the thickest part of the pork tenderloin. Cook until meat temperature gets to 150°. 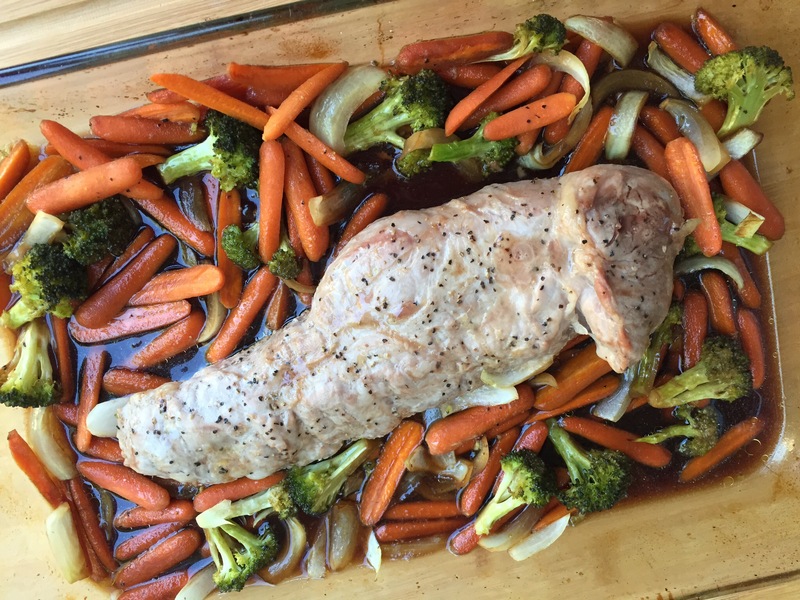 Remove the pork tenderloin onto a cutting board and cut into bite-size pieces. Add it back to the 9 x 12 pan along with the cooked brown rice and stir to cover everything with sauce. Continue cooking for an additional 15 minutes or until pork is cooked through, stirring once.